#259. Loch Coruisk. 42.5 x 60, oil on canvas. "Gilbert Munger 79" lower left. Offered for sale at Tajan (Paris) auction "TABLEAUX ANCIENS ET DU XIXE SIÈCLE" of 26 June 2008 as lot 118 with the title Twilight View of a Lake; estimate €8,000 - 12,000; bought-in. Subsequently offered by the seller for €7,000. Bought-in again at Artcurial (Paris) sale of 4 Oct 2013 as lot 510, est. €6,000 - 8,000. Sold at Artcurial (S.V.V.) auction in Paris on 7 Feb 2014 as lot 292 for €2,800 plus €737 in premiums. The catalog says the work is unfinished and unframed, but the former is probably a misinterpretation of condition problems. 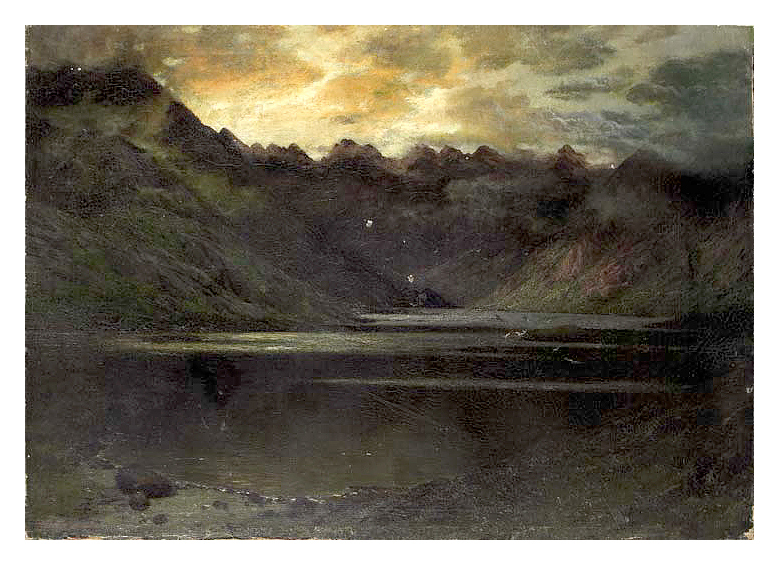 The Munger archive page tells us the Munger painted in Scotland in 1879 and this scene certainly looks Scottish. 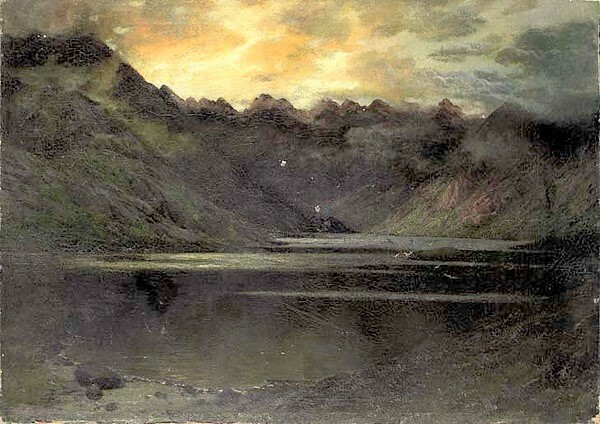 Two Scottish lochs are specifically mentioned as Munger submissions to the 1879 Royal Academy Exhibition: Loch Corusik on the Isles of Skye and Loch Maree in the northwest highlands. I contacted Stuart Mackinnon at www.mistyisleboattrips.co.uk who runs boat tours to Loch Coruisk. He confirmed that the painting depicts Loch Coruisk and sent along a photo to prove it. Image from online auction catalog.